Did you sleep through the auroras of Dec. 14th? Next time get a wake-up call: Spaceweather PHONE. AURORA WATCH: A solar wind stream is buffeting Earth's magnetic field and causing mild geomagnetic storms. Sky watchers from Scandinavia to Alaska should be alert for auroras. Photo details: Canon 5D, f/2.8, 16-35mm lens, 1/100 sec. 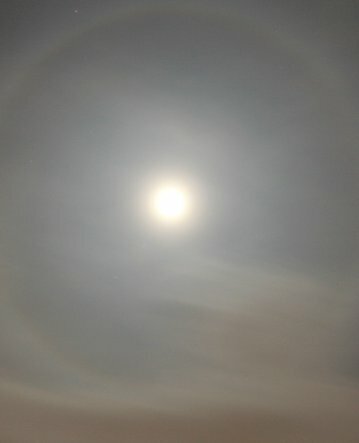 The glowing ring around this Wolf Moon is an ice halo. Tiny crystals of frozen water floating in clouds 5 to 10 km high catch rays of moonlight and bend them as shown. It's very pretty. Go outside tonight and take a look. 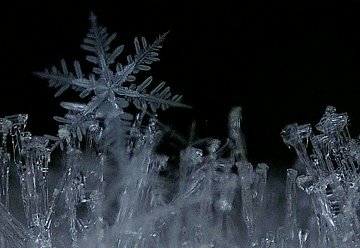 SNOWFLAKE AND HOARFROST: Not all the ice is in the clouds. Barb Robertson of Ottawa, Ontario, was taking pictures of hoarfrost growing between her front steps on Dec. 27th when "it started to snow," she says. "This lovely snowflake landed among the frost." Hoarfrost is winter's substitute for dew. Snow is winter rain. Put the two together and you've got a fantastic picture--if you can take it. "It was hard to get everything in focus," Robertson allows. NOAA Solar Flare and Sunspot Data: 1994, 1995, 1996, 1997, 1998, 1999; 2000; 2001; 2002; 2003; 2004; 2005; Jan-Mar 2006; Apr-Jun 2006; Jul-Sep 2006; Oct-Dec 2006.